Our vacation apartment can be rented throughout the year. Quietly located, it is heated and includes its own thermal pool from March to October. It is just a few paces from Sorgeto Bay (hot springs in the sea). It is even possible to swim here during the winter. 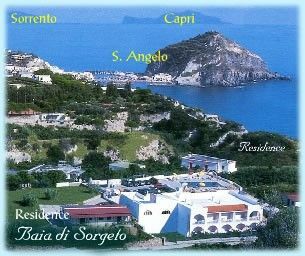 Me and my husband stayed at Residence Baia di Sorgeto for 8 days . The place is nice , clean and well maintained , the landscape is beautiful, the thermal pool is a gift , in the nearby you can buy local fruits and vegetables and also local wine. I would recommend it to anyone . We have just returned from a week at Peppino's Baia di Sorgeto in Ischia and had an amazing time. We had a studio apartment which included a small kitchenette with fridge, 2 gas hobs and plenty of storage, which enable us to have a couple of meals in with a bottle of local (very cheap) wine on the balcony. Peppino was always around to offer advice he made the stay comfortable and homely without interfering. The swimming pools with their natural springs were brilliantly detoxifying and relaxing and being September there were no fighting for sunbeds. We loved going into the pool late at night with nobody around as it was still 34 degrees in the water. There were some lovely restaurants nearby including Gisella (great seafood and price) Cenerentola (wonderful family atmosphere) and Luca (great pizza-D.O.C.). The island itself felt so safe with everyone, locals and tourists alike making you feel welcome and always wiling to help. Definitely recommend hiring a moped as this was an exhilarating way to see the best bits of the Island and for 25 euro for 24 hours pretty good price. If we go back we would hire one for the whole week. San angelo was a 30 minute walk down to the bay and well worth a visit, then Ischia town with it's beautiful Castello is a bus trip away 1.90 euro each way. Worth sitting on the bus and going all round the island, there are some beautiful views from the mountains near Fontana. Overall this was the best possible location and most beautiful place to see the wonderful Ischia from. We stayed a week and found the atmosphere of the place to be delightful - tranquil, with the sound of the water cascading into the geothermally heated outside pool. One is aware of the presence of the other residents, yet at the same time privacy is easily obtained. The listing description is quite accurate and the standard of cleanliness was satisfactory. The owner, Peppino, was a delightful host, always keen to chat and advise on activities, walks, etc. His enthusiasm and love for his residence is a main factor in the charm of this place. He willingly drives residents to the bus stop on arrival and departure. There are plenty of shops and restaurants in the nearby village, where there are bus connections to the whole island. Everywhere we went, we found the inhabitants and the visitors to be relaxed and happy. I can find no fault with the residence and would recommend it to anyone. My girlfriend and I had a ten night stay at Baia Di Sorgeto and it was the best holiday we have ever had. Everyone there was so pleasant and welcoming. The property was very nice and clean with amazing views all around. I would recommend a stay here to anyone wishing to visit Ischia as I do not have a bad word to say about my entire stay. The rooms are basic but you have everything you need. The service was fantastic and again, the people were very welcoming and helpful. I would like to say a BIG thank you to all at Baia Di Sorgeto for such a wonderful time and we hope to see you all again in the future. The island is renowned for its volcanic nature, hot springs and lovely gardens. There are numerous hiking possibilities and sights.